Nigerian banks are the ultimate currency black market traders in the way they charge users of their Visa and Mastercard. While the Central Bank sells forex to the banks at N197 to a dollar and N291.7 to the British pound sterling, charges by the banks to customers who used Naira denominated cards are closer to the black market rate, showing that the banks are profiteering on their poor customers. One customer of GTB Plc, did a transaction a few days ago for 1.76 pounds. The account holder was debited N698. By the official rate, the bank should have charged N517.50. Even if we allow a margin of 20 per cent profit to the bank, the bank should not have charged more than N620. The black market rate is at the moment N375 to a pound. One of our readers in e-mail also narrated his experience in a transaction in which GTB even ought to have debited him in Naira, but again chose to debit him with black market rate of N270 to a dollar. “Your report on the above subject is so true. 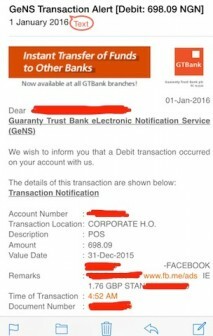 Please find attached here a transaction notice I received from GTB yesterday 4th instant. What saved the day for me was that fact that I funded my account to accommodate only the amount I needed to remit which was #52,000 so I had #53,000 in my account at time of transaction. Rather than charge @#199, they charge @#270. The British council I was trying to pay actually requested payment in naira boldly written on the merchant website. Why the bank chose to charge in dollars I can’t understand.